"Navigate to Opening Brace/Navigate to Closing Brace"
Using the search for "navigate", "brace", etc. in Settings/Keymap is without results. Where can I change the keymap for this? Could you be so kind and tell what version do you use (Help | About). Thanks. Please check this screenshot. 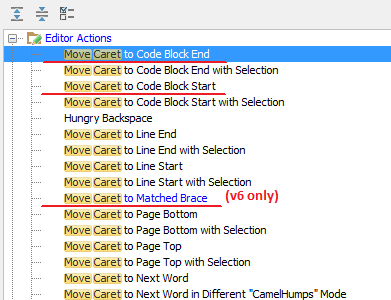 The action called "Move caret to Code Block Start/End"
Also -- if you do not know how action is called, there is a search functionality that allows you to search by shortcut -- should work fine in most cases (unless shortcut is very specific .. or you cannot "type" it on your computer/keyboard/layout). thank you Andriy for the quick response! ehm, where can I get v6? isn´t 5.0.4 the newest one? 5.0.4 is the latest stable version. Or is the online help newer as the downloadable versions? Online help reflects stable version -- it will be updated once v6 is released.